Managing Legacies in the 21st Century. Your Life. Your Purpose. Your Legacy. As I was preparing for the first workshop I was thinking of my elevator speech to quickly explain the project and I boiled it down to saying: "You will have an opportunity to write your 'Just In Case I Get Hit by a Mack Truck Letter' to loved ones". I thought it would make the subject a little lighter, give folks a visual and something everyone could relate to. Well, I've been traveling on the road a lot, since my mother's death, and I've been looking for Mack Trucks as I've been driving. Although there are a lot of big trucks on the road you don't see many MACK trucks, but when you do see them, you CAN'T ignore them. The word MACK is written on the grill in big bold letters. The only other truck that I saw that had it's brand predominately on the grill was GMC but it just didn't have that same bold feel as the word MACK. 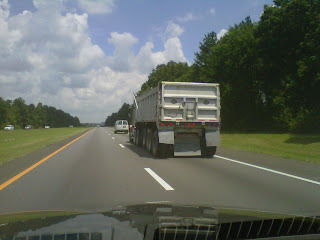 All the other trucks had slashes and the emblem or name of the brand in very small letters on the slash. This was mostly because names like Freightliner are too long. MACK is in your face....kind of like death. You can't ignore it. No matter how much you might try, death is always chasing you everyday and every moment of your life, weather you realize it or not. Here's a picture of a MACK truck I took from the car...of course I couldn't take a picture of the front of the truck and you can't really see the word MACK on the back...but it's a MACK truck. If you get hit by one of these babies...you're a gonner for sure. "Just In Case I Get Hit by a Mack Truck Letter"
Copyright 2018. Simple theme. Theme images by fpm. Powered by Blogger.